The 5th Indian Nationals kicked off with the Bengal Tigers defending the seniors title and Jharkhand Crows hoping to defend the juniors title. Teams competing included the Maharashtra Giants, Odisha Swans, Rajasthan Eagles, Tamil Kangaroos and the Kerala Bombers. 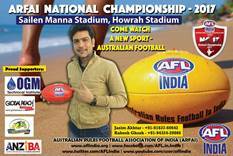 For now, the Jharkhand Crows are the toast of Australian Rules football across India and have raised the bar even higher ready for next year. With Kevin Sheedy now taking a firm interest in the further development of the game in India, next year could be even bigger, bolder and better again. 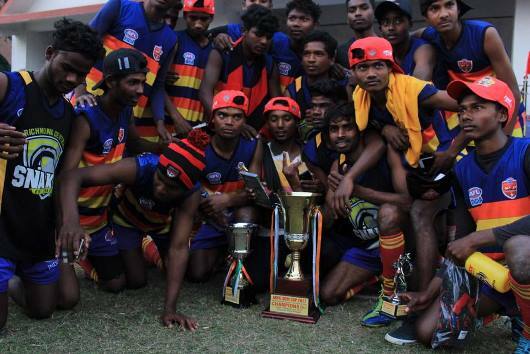 Picture: Jharkhand Crows players with their dual trophies from the event in Kolkata.